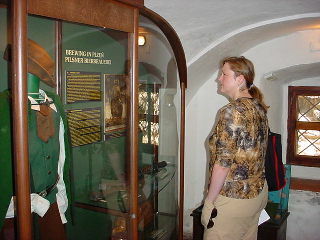 In June of 2004 Owen Ogletree and Kerri Allen traveled to the old Czech brewing town of Plzen to seek out the breweries, bars, and restaurants that offer classic Czech beers and atmosphere. Get a good guidebook of the Czech Republic that has maps and a street index, and you will be able to pinpoint all the addresses given below. The personable locations listed below offer wonderful atmospheres in which to enjoy your beer and Czech cuisine. Beer and food in the Czech Republic is inexpensive compared to western Europe, but be sure to estimate your total bill before you give up the menu, as some places add on extra charges. Bread and shots of liqueurs that are offered to your table (and not refused by you) will be added to your bill. 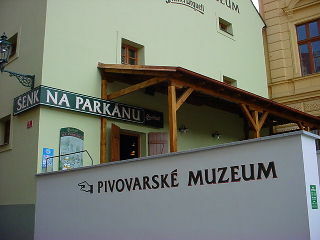 Language is not a real issue in Prague and Plzen as most places offer English menus. There is almost no air conditioning in the Czech Republic, so be prepared for a little warmth if you visit in the summer. Plzen is a small town that is very walkable, and all pubs listed below are just off the Republiky main square (except for the Pilsner Urquell brewery which is a short walk across the Radbuza River). Pilsen is probably one of the most famous brewing towns on the planet -- print out this page and let it be your beer guide to the birth city of Bohemian Pilsener beer! Zbrojnicka 8 -- just off the SE corner of Republiky square. Beer usually comes in degrees of strength from 10 to 12. 10 is the lighter version; 12 being the strength of imported Pilsner Urquell. 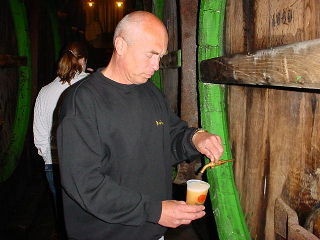 Beers over 12 (such as the black 13 degree U Flecku brew are rare treats in the Czech Republic). 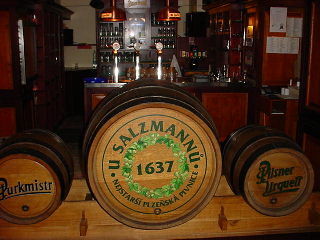 There are very few styles of beer available in the Czech Republic, with the most famous being Bohemian Pilsners of various strengths offered in half-liters. 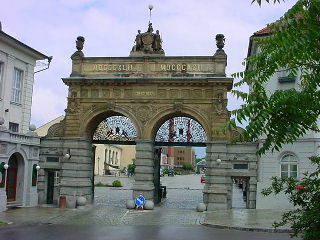 Pilsner Urquell is the ubiquitous beer in the town of Pilsen. Dark Czech lagers are usually sweeter and less hoppy than Pilseners with more of a caramel flavor. No visit to Pilsen would be complete without a stop in the very old Museum of Brewing. The building was once a malthouse that supplied the town's brewers in the middle ages. It was also a brewpub in the early part of the 20th century. Under sponsorship of the Pilsner Urquell brewery, the museum is now one of the most detailed and impressive beer museums in Europe. 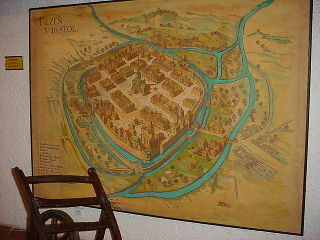 It is also one of the most popular tourist spots in Pilsen. It is located only two blocks from the main square. This establishment is right around the corner from the museum listed above. The pub is cheerful and friendly and has been renovated of late to be more appealing to tourists. Their food is very appealing, and Pilsner Urquell highlights the beer menu. The church steeple in the main town square (Republiky) is the tallest in the Czech Republic. After you have taken in the sights and sounds of the church be sure to pop into the Salzmannu pub for a half liter of Pilsner Urquell. 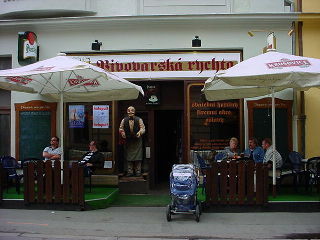 This is a very traditional, well established Czech public house that welcomes locals and tourists alike. Antique beer barrels are a welcoming sight as one enters the front doors. Food here is tasty and filling. This pub has a big menu that includes delicious traditional Czech dishes right alongside pizzas. Pilsner Urquell is available on draft downstairs in the main bar. Staropramen, Krusovice (light and dark), and Pilsner Urquell are on tap in the upstairs restaurant. If you walk out of the front doors of the main church steeple in the Republiky square, all you need do is walk across the street to find our next pub. Formanka was opened in the early 1990s, but looks and feels much older. Go in the door and walk down a stark hallway to find the cellar pub. Kozel (pale and dark) and Pilsner Urquell (of course) are available. The atmosphere is pleasant and the food consists of hot and substantial Czech dishes. 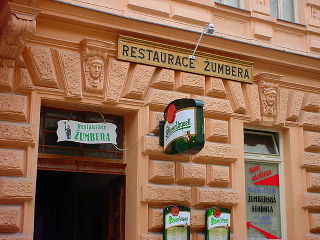 Zumbera has been remodeled to be a bit more upscale. The trappings of the interior are attractive, but seem a bit polished for such an old pub. The food here is excellent and hearty, and the beers include Kozel and Pilsner Urquell. The bar now has music on some nights. 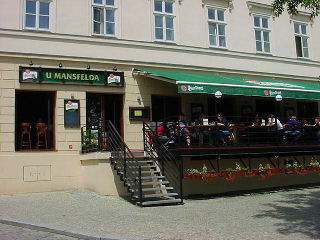 If you are heading east from the main square toward the river on your walk toward the Pilsner Urquell brewery, be sure to stop by Mansfelda. This is one of the new Pilsner Urquell "original" pubs that has been opened recently. The interior is spotless and beautiful, the outdoor deck is grand with nice views of the park, and the food and Pilsner Urquell are scrumptious. Prices are a bit higher here than in other pubs in the city. Stara Sladovna is an absolute delight. Located on a small side street two blocks north of Republiky square, this pub is housed in what was once a torture and execution chamber in the middle ages. There are dried hops on the ceiling, old stone walls, and a big open fireplace in the center of the main dining area. Stara Sladovna has one of the best beer (including Kelt Stout) and mead (honey wine) selections in Pilsen. Be sure to try the Korma (a mixture of beer and mead). The atmosphere will convince you that you've stepped into the 1500s, and the mead honey cake is a perfect ending to the wonderful meal that you will enjoy here. 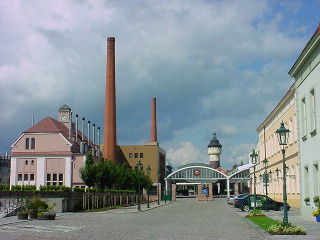 The westernized name for the Plzensky Prazdroj brewery is Pilsner Urquell. 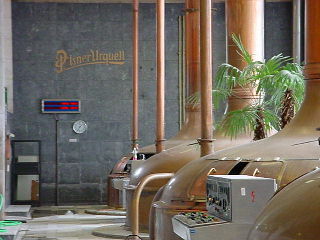 Pilsner Urquell is famous around the world as the originator of clear, golden lagers. As you enter the brewery yard through the old brewery gates you will see the large visitors center to your left. Tours are offered daily at 10:30 am, 12:30 pm, 2 pm, and 3:30 pm. The friendly guides will lead you to a view of the new brewery and walk you through the labyrinth of the old brewery cellars. Pilsner Urquell was recently purchased by SAB Miller and has shifted production from their old pitch-lined, wooden fermenters to sparkling new stainless steel; but it is still a rare treat to visit this remarkable mecca of brewing history. 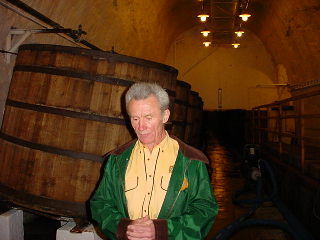 through the Pilsner Urquell brewery experience. The Pilsner Urquell brewery landscape is always impressive. The best part of the brewery tour is sampling the young Pilsner Urquell beer from some of the old wooden lagering tanks that have been preserved in the cellars. 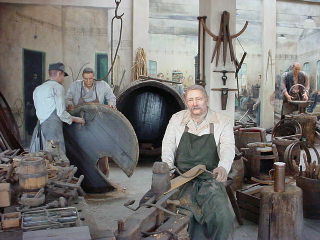 The coopery workshop exhibit demonstrates how the wooden barrels were made at the beginning of the last century. After your tour be sure to enjoy a traditional Czech meal and a half-liter (or more) of Pilsner Urquell at the brewery restaurant Na Splice. 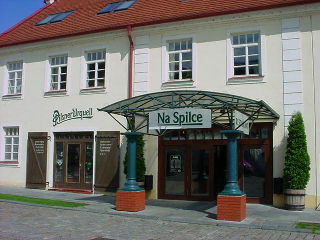 Na Splice is open daily 10 am to 10 pm.